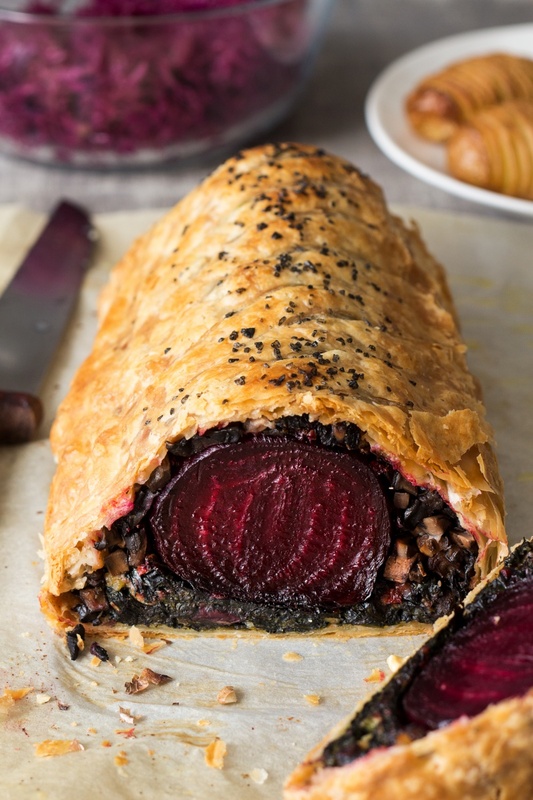 PS: YOU MAY ALSO WANT TO CHECK OUT OUR NEW, IMPROVED BEET WELLINGTON RECIPE HERE. ‘But what are you going to make at Christmas?’ is a question I have heard a lot ever since I went vegan. An average person has trouble imagining a big family gathering – like Christmas or Thanksgiving – without a meat centrepiece. I totally get that, even though I no longer eat meat. When my next door neighbours are making a roast chicken for a Sunday dinner, it still smells nice to me and brings back the memories of family meals…I mean, it’s impossible to completely erase a lifetime of food memories just because your meat eating blinkers have finally come off. As it is nice to have an impressive centrepiece that everyone round the table can share, I’ve decided to come up with a plant-based tradition of my own. Last year I attempted vegducken, which was, hands down, an unmitigated disaster. Don’t get me wrong, I’m not slagging the recipe off here. Living on a small island, I have had to do a few substitutions and I couldn’t quite find a trio of vegetables that would fit one into another snugly and the result was really not that tasty. This year, inspired by my favourite Aussie Masterchef, I decided to attempt my version of Beet Wellington. It took me a few goes and there were some tears and some swearing until I got it right, but I am finally happy to present you with something we’ve been enjoying in our Lazy Cat Kitchen ‘test kitchen’ for the past week. One key lesson from my fails is that instead of spreading the mushroom mixture (known as duxelles) on the pastry and then attempting to roll the Wellington, it is way more prudent to stack the filling up high 2 thirds down the sheet of pastry and fold the pastry tightly over it. 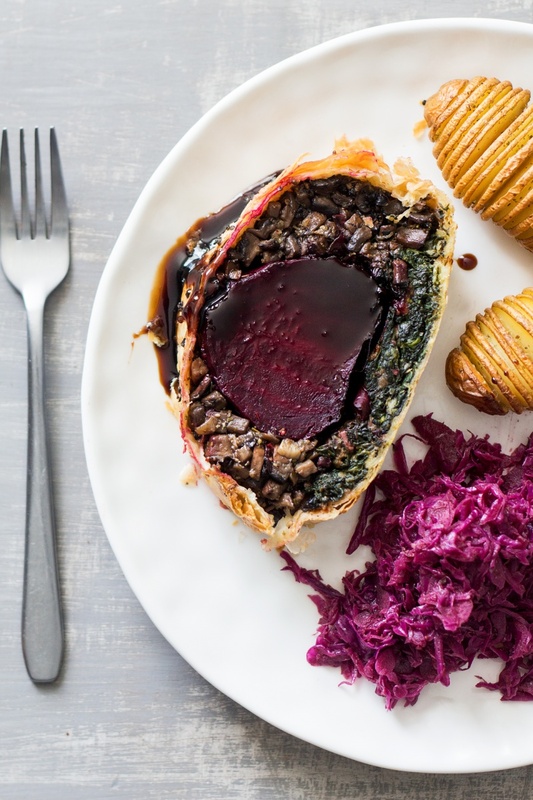 It works a treat and if you get a helping hand at that stage to ensure that there is no slack in the pastry, you’ll end up with a neat parcel of plant-based goodness wrapped up in a crispy puff pastry shell. Gorgeous to look at, perfect for sharing and delicious too! I’m happy to announce that my very own plant-based tradition is born. PS: If you make my beet Wellington, don’t forget to tag me on Instagram as @lazycatkitchen and use the #lazycatkitchen hashtag. I love seeing your takes on my recipes! Put a small frying pan on a medium heat and dry roast walnuts until lightly browned and fragrant. Make sure you move them around the pan frequently as they burn easily. Chop roughly once cool. Heat up the oven to 200° C / 390° F and line a baking tray with a piece of baking paper. Peel the beetroots. Pound 3 tsp of dry rosemary with 1½ tsp of coarse sea salt in a pestle and mortar until you get fine rosemary salt. Brush the beetroots with olive oil and sprinkle with some (not all) of the rosemary salt. Place on a baking tray and put into the hot oven for about 1 hour (until the beetroots can be easily pierced with a knife). Place balsamic vinegar and sugar in a small pot. Bring it to the boil gently and allow it to simmer for 20 minutes or so until the liquid reduces by about ½ and becomes thick. Beware that it will become even thicker once it cools so don’t let it reduce too much. If you do, add a splash of water to bring it back. Heat up 3 tbsp of olive oil in a heavy base pan. Add finely chopped shallots to a hot oil (you want them to sizzle once added to the pan). Fry on a low heat stirring from time to time, until lightly browned. Add garlic and fry it off for a few minutes until soft and fragrant. Chop your mushrooms into a fine dice (you can also use a food processor) while you’re frying the shallots and garlic. Now, remove one third of the shallot and garlic mixture and set aside. Add chopped up mushrooms into the pan and coat in the shallot and garlic mixture. Cook mushrooms on a medium heat until all the water evaporates. Add wine to the pan and allow it to cook out. Season the mushroom mixture with some of the rosemary salt and black pepper. Let it cool. Once cool, add chia egg and mix well. The mixture should be sticky but not watery. Wilt spinach in a warmed-up pan with a lid. Once wilted, allow it to cool completely. Once cool squeeze all the water out of the spinach using your hands or a muslin cloth. Go over the spinach twice or even three times to ensure that it is as dry as possible. Place spinach in a large bowl, season with rosemary salt, pepper and nutritional yeast. Add shallot and garlic mixture you’ve set aside in step 6, ¼ cup of breadcrumbs and fold in toasted walnuts. Line a baking tray with a fresh sheet of baking paper and heat up the oven to 200° C / 390° F.
Flour the baking paper very lightly and place a defrosted sheet of puff pastry on it so that the shorter pastry edge is facing you. Designate a long, narrow (about 10 cm / 4 in by 25 cm / 10 in) area where the filing mixture will be stacked. Place it about 5 cm / 2 in from the edge of the pastry so that the pastry on the other side of the filling is long enough to be folded over the filling. Leave 5 cm / 2 in margin at the ends too so that you are able to fold the ends nicely. Scatter a bit of extra breadcrumbs on the pastry, under the filling to prevent a soggy bottom 😉 . Start the stack by making a long rectangle with the spinach mixture. Press it down well with your hands so that it is tightly packed. Place four roasted beetroots in a long row over the spinach. For more stability, you may want to skewer all the beetroots together with a long wooden skewer, which you can pull out after cutting into the Wellington. Now mould the mushroom mixture over the beetroots making sure it fills all the nooks and crannies tightly. Finally, fold the pastry over the filling as tightly as you can – it’s good to have another pair of hands here to make sure the pastry is tightly wrapped around the filling. Seal it together with the 5 cm / 2 in margin you left on the other side. If there is too much overlap, trim the excess. Wrap the pastry at both ends like you would wrap a present. 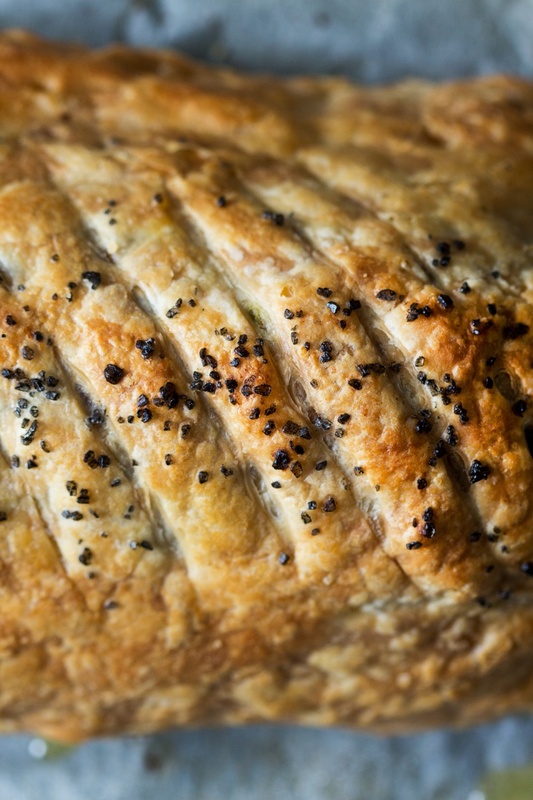 Make shallow cuts on the top of the Wellington with a sharp knife. 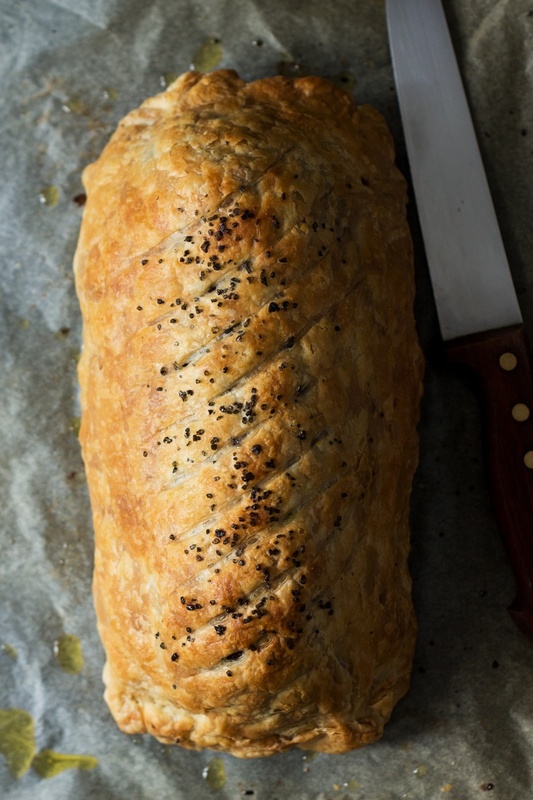 Brush soy milk and aquafaba ‘egg wash’ all over the Wellington and sprinkle the top with your garnish of choice – I used black salt. Make three small holes in the pastry (on the side where the seam is) to ensure steam can escape during baking and the pastry does not burst. Bake for about 60 minutes, until golden. Serve with your favourite side dishes drizzled with the balsamic reduction you made earlier. *I know that Jus-Rol and Pepperidge Farm are definitely vegan and that Dufour definitely isn’t. If in doubt, check the packet for more details. **Reduced aquafaba simply means simmered, without a lid on, until excess water evaporates and aquafaba becomes like an egg white. Please cool it down completely before using in this recipe.